Mr. Bongo Films continue their quest to bring lesser seen world cinema classics to DVD with the upcoming release of three films from three of Italy's finest directors, each being released for the first time on UK DVD: Bernardo Bertolucci's murder mystery The Grim Reaper, Pier Paolo Pasolini's heart-breaking Mamma Roma and Ermanno Olmi's comedy drama Il Posto. 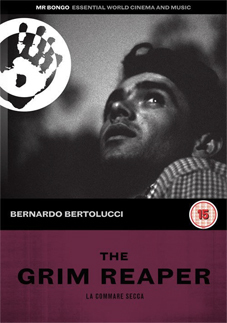 Bertolucci's directorial debut The Grim Reaper (aka La commare secca) is based on a book by Pasolini and tells the story of a prostitute who is brutally murdered in a park near the Tiber River in Rome. The police track down all visitors to the park that night with hope of catching the killer, the story is told in flashbacks as each suspect gives their account. Said The New York Times of the film and its director, "‘Vivid proof of his ability to generate genuine tension in a classic whodunit format." 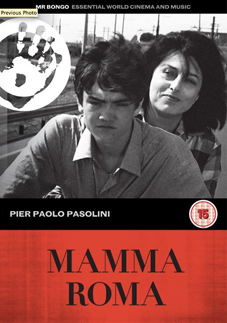 Described by Time Out as "A work of shattering beauty," Pasolini's Mamma Roma stars the Academy award-winning Anna Magnani (The Rose Tattoo) who plays the lead role of a prostitute who attempts to better her life for her son Ettore (Ettore Garofolo – Ro.Go.Pa.G.). But her efforts may be too late as Ettore is drawn to the street life and ironically falls for a young whore. 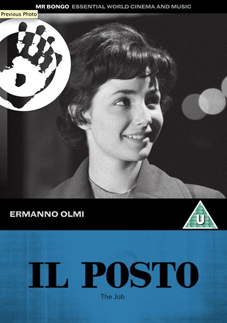 Olmi's semi auto-biographical Il Posto (aka The Job) is a satirical take on the daily grind of working life. A young suburban boy, Domenico, has big dreams of working in a big city corporation and after a gruelling entry process he lands a job as an errand boy. Here Domenico meets Antonietta and the pair embark on a relationship as he begins to climb to the corporate ladder. Said Time Out of the film, "Has a hero of Keatonesque ingenuousness...A delight." All three films will be released on UK DVD on25th April 2011 by Mr. Bongo Films at the RRP of £12.99. No extras have been listed.